Rustaq is a small city of 26000 inhabitants in Oman's interior, about 110km west of Muscat, in the Al Batinah region of northern Oman. The city has a fort which was built in 1711. Ibri is the capital of the Al-Dharirah region. 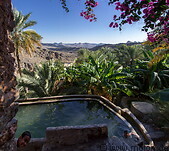 Nizwa lies in an oasis, about two hours by car southwest of Muscat. It's a major tourist centre in Oman, with a fort and a souk as its main attractions. During the 6th and 7th centuries it was the capital of Oman. Bahla lies in a palm tree oasis about 40km from Nizwa. It has one of the oldest fortresses in Oman, the 13th century Bahla fort. This has been on the UNESCO World Heritage list since 1987. Misfat is a small, ancient village in the mountains near Bahla. It is accessible via a narrow mountain road and is surrounded by palm tree and banana plantations. Al Hamra is village at the foot of the Hajar mountains, one of the oldest in Oman. 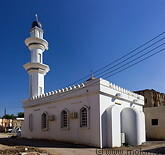 Al Mudayrib is a small village close to the Wahiba desert, located in a palm tree oasis. There are several towers likely used for defensive purposes and the ruins of some 18th century buildings.